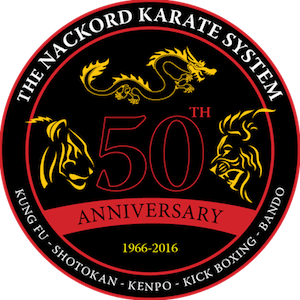 Welcome to The Nackord Karate System, where men, women, and children have enjoyed the highest quality Martial Arts classes since 1969. We are proud to offer you a spacious martial arts training center conveniently located in the Gateway shopping center in Wayne. Our staff is led by a dedicated team of instructors, including GrandMaster Dennis Nackord - a 10th Degree Blackbelt with more than 5 decades of experience teaching the martial arts. We offer cutting-edge classes for all ages and experience levels and we pride ourselves on providing a quality martial arts education for everyone who comes through our doors. Whether you're looking for weight loss and strength gains or you're hoping to pursue your Blackbelt, we've got you covered with a system of support and expertise. Learn more or GET STARTED TODAY by filling out the short form on your screen. All of our classes are taught by high-ranking adult black belts. Many of our instructors are also doctors, lawyers, artists, physicists, and school teachers who have been training with Master Nackord for more than 25 years. Our system is comprised of Karate, Kenpo, Jiu-Jitsu, Western and Eastern boxing styles, weapons practice, defense, more! Put together, they create a well-rounded mixed martial arts system that’s good for self-defense and a well-balanced life. Our goal every day is to inspire students to become the best they can be on the inside. All of our classes promote perseverance, concentration, and self-confidence, each of which serves as a cornerstone for self-defense, the workplace, and everyday life. We pledge to offer you safe and sustainable training methods. Each of our classes emphasizes flexibility and strength, helping you avoid injury and stay active. Enjoy everything that comes with a healthy lifestyle when you join us today! Since 1969, the Nackord Karate System (NKS) has helped thousands of people strengthen their psyches as well as their bodies through teachings based on ancient martial arts ideas. While other martial arts styles, fitness programs and self-improvement methods have many well-known benefits—improved strength, endurance, flexibility, stress reduction, self-confidence, etc.— no other activity but the NKS has all of these benefits in one place. Our effectiveness comes from using logical, simple and incremental steps with well-defined goals, all lead by skilled and knowledgeable instructors. In addition, a shared sense of purpose and an atmosphere of mutual respect enhance the process. At the foundation of the NKS is The Way of Three. While the purpose of external martial arts systems is the control of one’s opponent, these Eastern philosophies come from internal martial arts where the purpose is to control one’s own health and emotion. Ancient exercises focus on breathing, stretching the body, strengthening joints and spine, and calming the mind.